Physical characteristics: Greater flamingos are the largest species of flamingo. Most greater flamingo adults are white with a little pink in color, but those living in the Caribbean area are rosy red (the color depends on the food they eat). Their flight feathers are black and their bills are pink with a black tip. They are between 47 and 57 inches (1.2 to 1.5 meters) long from bill tip to tail, and they weigh between 4.6 to 9.0 pounds (2.1 to 3.4 kilograms). The males are larger than the females. Geographic range: Greater flamingos live mostly near the seacoasts and on islands in the Caribbean, Africa, Asia, and Europe. There are some big inland populations in eastern Africa and Pakistan. Greater flamingos sometimes visit the Florida Keys and other places in southeastern United States. usually salty, but some greater flamingos also feed in fresh water or in rice fields. Diet: Greater flamingos sweep their heads upside down in shallow water and pump the water in and out of their bills with their tongues. Small water organisms get sucked into their mouths between the comblike bristles in their bills. Their food includes insects, brine shrimp, snails, seeds, algae, and diatoms. Behavior and reproduction: The greater flamingos that breed the farthest north in Europe and Asia migrate south in fall and fly north again in spring. But most of these birds do not migrate. Instead, they move around in huge flocks as the water levels change during rainy and dry seasons. If the conditions are not just right at a breeding lake, the flamingos may not breed at all. Or they might all go off and find a new place to breed. If a breeding site is exceptionally good, the birds may raise two chicks in the same year, one right after the other. When a pair of greater flamingos builds a mud nest, both help with the job. 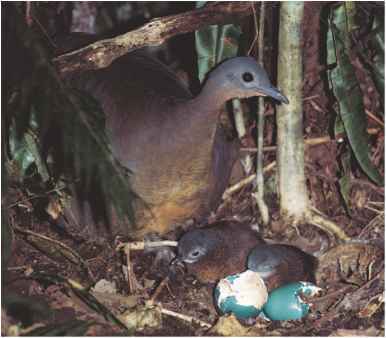 If they nest on a rocky island, however, the female lays her one egg on the ground. The parents take turns sitting on the egg for about a month. When the chick hatches, they feed it a nourishing red liquid that they make in their throats. The chicks bark like puppies when they want to be fed. Parents know their young by their voices and will feed no other chicks, even when the young are gathered in groups. The parents feed them the red liquid meals for four weeks, and then they start to feed them food that they regurgitate (cough up) from their stomachs. By the age of ten to twelve weeks, the young birds can fly off and feed themselves. Greater flamingos and people: Thousands of years ago, the Egyptians used greater flamingos as the symbol for "red" in their picture writing. They also called flamingos the living form of Ra, their sun god. Roman emperors ate flamingo tongues as a specialty, while Roman poets wrote that it was a shame to kill such beautiful birds for their tongues. Some people still kill greater flamingos for sport or to eat their meat and eggs, but many of the birds live in protected or hard-to-reach areas. Since the invention of plastic, some people have enjoyed having flocks of pink plastic flamingos on their lawns. Brown, Leslie H., Emil Urban, and Kenneth Newman. The Birds of Africa. Vol. 1, Ostriches to Birds of Prey. Princeton, NJ: Academic Press, 1982. Collar, Nigel J. Pink Flamingos (Flamingos in East Africa). New York: Abbeville Press, Inc., 2000. "Flamingo." In International Wildlife Encyclopedia, 3rd ed, vol. 6. Tarry-town, NY: Marshall Cavendish Corp, 2002. McMillan, Bruce. Wild Flamingos.Boston: Houghton Mifflin Co., 1997. Al Jandaly, Bassma. "Flamingo Habitat Set for Clean-Up." Asia Africa Intelligence Wire (October 9, 2003). Boroughs, Don. "Rift Valley Shuffle (Flamingos Moving Around in East Africa)." International Wildlife (January 1999). "Clouds of Flames." Birder's World. (October 1999): 38. "Flamingos' Flight a First (New Zealand's First Colony of Flamingos)." Geographical (October 2001): 11. Geschickter, Jacqueline. "Pink Parade: Nassau, Bahama Islands." National Geographic (June 2001): 9. "Lost Flamingo (Lost in Siberia on Migration)." Russian Life (January/ February 2004): 10. O'Connor, Anahad. "Flamingo Paradise is Losing its Luster." New York Times (July 23, 2002): F3 (Late Edition, East Coast). "Pretty in Pink." New Scientist (October 11, 2003): 65. Regis, Necee. "The Shy Beauty of the Everglades." Boston Globe (February 16, 2003): M1. Rudovsky, Shari. "In the Pink." Natural History (October 1987): 104-105. Johnston, A. A. "Greater Flamingo." BWP Update 1 (1997): 15-24. Harper, David. 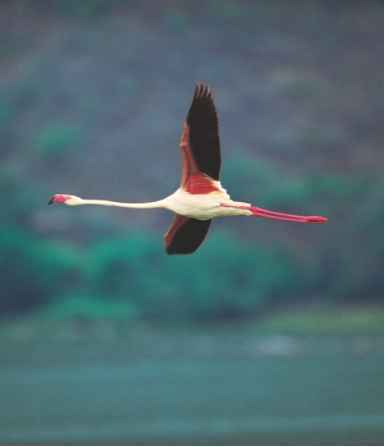 "Flamingo Conservation in Kenya." University of Leicester, United Kingdom. http://www.deh.gov.au/discussion-groups/apmw/ msg00199.html (accessed on May 8, 2004). Miller, David. "Flamingo Conservation in the Yucatan." National Aviary, Pittsburgh. http://www.aviary.org/csrv/flamingo%20conservation.php (accessed on May 8, 2004). "Scientists Corral, Band and Release Over 300 Threatened Flamingoes for Research." International Society for Salt Lake Research. http://www.isslr.org/news/newsone.asp?qnewsid=235 (accessed on May 9, 2004). Wetlands International. http://www.wetlands.org (accessed on July 13, 2004).